Vegetable Gardens, Flowers and Farms. Garlic Barrier is a very strong liquid garlic extract that mixes with water and is sprayed on farm and garden plants to keep insects off. The garlic used in Garlic Barrier is a very powerful variety which is much more potent than the garlic found in grocery stores (in fact, our lab people here refer to it as "super garlic"). There is a huge list of insects that it works on and you may see them by reviewing our label on this web site (see link to label info at page bottom). One gallon, properly mixed with water, covers 10 to 12 acres of row crops or 5 acres of orchards. It imparts no garlic taste on any crops or plants that are sprayed. The odor of garlic in the air or on the plant disappears in about 30 minutes. It's all natural and listed by OMRI as suitable for organic farm use. It's marvelous for farm, home garden and lawn care use and completely safe around people, pets, animals and fish. As you read and learn about Garlic Barrier, please make sure you scroll down to the bottom of this page where you will find additional links and information about our product. Garlic Barrier does a wonderful job of keeping birds from eating fruit crops like cherries, pears, apples, figs and berries. In cherry trees, dilute one gallon of Garlic Barrier in 300 gallons of water and spray the solution on the trees to keep birds away from your fruit for a week. Only spray the trees when the fruit begins to ripen and the first birds appear. Garlic Barrier leaves no taste in the fruit at all and there is no re-entry time so you can spray up to the day of harvest. The USDA Wildlife Research Center evaluated the effectiveness of garlic oil used as a repellent. Click here to read the publication. To place an order on-line right now, Click Here! 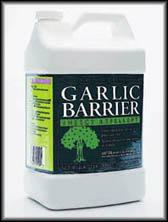 For dealer or distributor pricing of Garlic Barrier, Click Here! and click the Find Retailer button. Bookmark this site now for easy future reference. Want to buy some Garlic Barrier right now? Click here to make an immediate on-line purchase. If you're in Canada, you can purchase Garlic barrier directly from our Canadian distributor by clicking here. Italian customers can purchase Garlic Barrier directly from our Italian distributor by clicking here. Customers in India can purchase Garlic Barrier products directly from our exclusive distributors in India by clicking here.